Through the years, it had been known as the "system of cutters," the Revenue Marine, Revenue-Marine Service, and Revenue Service until the title Revenue Cutter Service found its first statutory use in an act passed in 1863. Currently, the United States Coast Guard is the largest component within the United States Department of Homeland Security. "You must give us bigger guns than that, boys," shouted John McGowan of the U.S. Revenue Marine, as the U.S. Coast Guard was known, at the Confederate gunners, when their cannon ball fell short, ricocheted off the water, and bounded completely over his vessel, "or you'll never hurt us." As if in reply, a Secessionist battery on Morris Island fired a heavier gun. The seaman taking soundings felt the ball slam into the hull below him and frantically scurried for safety. McGowan called after him: "You're much safer where you were! Lightning never strikes twice in the same place!" McGowan was commanding a lumbering, unarmed side-wheel freighter manned by merchant seamen but carrying Federal soldiers and military supplies. This ship was far different from the swift, armed revenue cutters in which he had pursued slavers, smugglers, and pirates. Now, on January 9, 1861, as skipper of the Federal-chartered merchantman Star of the West, he was attempting to bring supplies and reinforcements to the besieged Union garrison at Fort Sumter in Charleston Harbor, South Carolina. He expected to use the same sort of trickery as those smugglers whose voyages he had sought to disrupt. Success depended upon secrecy, but this operation was one of the worst-kept secrets of the deepening national crisis. Ample warning and enthusiastic gun crews doomed the venture to failure. Star of the West approached Charleston Harbor at first light. McGowan hoped his vessel would pass for a coastal trader. As soon as the batteries opened fire, he hoisted a second large American flag but, as the ranking Army officer on board observed, "the one was no more respected than the other." The closer McGowan drew to Fort Sumter, the more rapid became the Confederate fire. Realizing the futility of continuing against the well-served shore batteries, McGowan reluctantly ordered his ship out of the harbor. McGowan's rebuff by rebel artillery was the first skirmish of the American Civil War. Just three months later, Abraham Lincoln, new to the presidency but determined to "hold, occupy and possess the property and places belonging to the Government," dispatched warships to relieve Fort Sumter. The angry South Carolinians reacted on April 12, 1861 with a cannon bombardment that forced the fort's surrender two days later and touched off the four-year long, fratricidal struggle. ". . . an incident occurred, which I have never seen recorded, but which seems to me worthy of not. A vessel suddenly appeared through the mist from behind the Bar, a passenger steamer, which was made out to be the Nashville. She had no colors set, and as she approached the fleet she refused to show them. Captain Faunce ordered one of the guns manned, and as she came still nearer turned to the gunner. 'Stop her!' he said, and a shot went skipping across her bows. Immediately the United States ensign went to her gaff end, and she was allowed to proceed. The Harriet Lane had fired the first shotted gun from the Union side." Thus, a USRM vessel became the first one of either side to fire a shot in the Civil War. Ironically, the role that the U.S. Revenue Marine -- the forerunner of the U.S. Coast Guard -- played in this conflict has remained virtually unknown to the general public, most writers on this period, and even some scholars. This is due in no small measure to the fact that this unique military service -- the nation's oldest continuous sea-going one -- then operated as part of the Treasury Department during peace time and with the Navy during war. Moreover, through the years, it had been known variously as the "system of cutters," the Revenue Marine, Revenue-Marine Service, and even Revenue Service until the title Revenue Cutter Service found its first statutory use in an act passed in 1863. Following Fort Sumter, the cutter Harriet Lane soon saw action again. Because of her speed and shallow draft that permitted her to work close inshore to cover troop landings with her 8-inch gun and four rifled 32-pounders, the Navy used her extensively in blockading squadrons, bombardments, and amphibious assaults. In late August 1861, the cutter participated in the first joint amphibious operation of the war. The objective was the capture of the strategic Confederate forts at Hatteras Inlet, North Carolina -- the vital gateway for rebel privateers and blockade runners. "At twenty-five minutes past ten the Harriet Lane opened fire, and soon after the Cumberland came in from the offing and joined in the attack. The Harriet Lane, with her rifled guns, did good execution, several projectiles from the eight-inch going into the battery and one going through the ramparts. The fire was so hot that all of the enemy that could do so got into a bomb-proof in the middle of the battery." There are no known photographs of the famous United States Revenue Cutter Harriet Lane. This action -- the first real Union victory of the war -- was the last important one for the Harriet Lane as a cutter of the U.S. Revenue Marine. Soon after, on 17 September 1861, she left the service through a permanent transfer to the Navy. The subsequent misadventures of this ship, probably the second most famous cutter in the entire history of the U.S. Coast Guard, took some of the luster off her earlier heroic exploits. On New Year's Day of 1863, the Confederates captured her at Galveston in a bloody, rough-an-tumble boarding with pistol and cutlass. After service in the Confederate Navy, she was converted into a blockade runner. With the end of the war, she entered the merchant shipping trade with a new name. Her end came ignominiously in 1884 off Pernambuco, Brazil, when she was abandoned after becoming waterlogged. Even before the fall of Fort Sumter, as one Southern State after another seceded from the Union, many military officers were subjected to a soul-wrenching conflict of allegiances. Those in the U.S. Revenue Marine were not exempt. Captain James J. Morrison, USRM, a Virginian by birth and the commander of the revenue cutter Lewis Case at Mobile, was a typical case. This weather beaten veteran of service aboard cutters in both the Seminole and Mexican Wars developed doubts about the morality of drawing his sword against his native state, relatives, and friends. In the end, he surrendered his ship to the authorities of the State of Alabama. His officers and crew, not sharing his sentiments but helpless to prevent his act, banded together. Under the leadership of Third Lieutenant Charles F. Shoemaker, they made their way throughout the length of the hostile South before reporting aboard other cutters. When southern-born Captain John G. Breshwood, USRM, balked at moving his revenue cutter Robert McClelland from New Orleans to New York, Secretary of the Treasury John A. Dix responded firmly to forestall the surrender of the ship to the seceded State of Louisiana. He wired the second in command of the cutter, to arrest the captain, assume command, treat Captain Breshwood as a mutineer if he tried to interfere, and "If anyone attempts to haul down the American flag, shoot him on the spot." These strong words, although intercepted and never delivered, would have fallen on deaf ears, for the second in command was as much a rebel sympathizer as his captain. They went over to the Confederacy, taking the cutter with them. Nevertheless, Secretary Dix had provided a stirring slogan and rallied Union morale at a critical point. 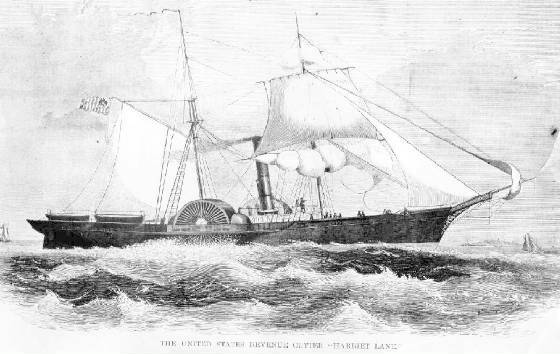 With the outbreak of hostilities, or even before, as in the case of the USRM cutter Harriet Lane, President Lincoln ordered several USRM cutters to combat duty with the Navy. Here, they performed whatever missions assigned, from blockade duty on the coast and inland waters -- where the cutters rendered "incalculable service" by preventing men, mail, supplies, and money from reaching the South -- to chasing Rebel privateers and providing naval support for Union military ventures. The cutters remaining under the Treasury Department were desperately needed for law enforcement under wartime pressure. With tariffs increased some 50 percent to help finance the war effort, smuggling had become a major industry. The emergency found the USRM, like the other military services, ill-equipped. Already, the Confederate flag flew over five seized cutters, while another had been lost during the Federals' hasty withdrawal from the Norfolk Navy Yard. In the scramble for ships that ensued in the North, many strange vessels were commissioned, but the emphasis was on steamships, for the Age of Sail had passed. Witness the orders given to Captain H. B. Nomes, USRM, of the sailing cutter Forward, which had the mission of keeping open a course for transports in the Chesapeake Bay from Perryville, Maryland, to Annapolis. He was directed to "capture or sink any unfriendly craft" and to "urge any U.S. steamer he met to give his schooner in tow in furtherance of duty assigned." President Lincoln, even though somewhat confused as to the proper administrative chain of command for the USRM, helped secure one vessel. Within weeks of the firing at Fort Sumter, he dashed off a note to the "Hon. Sec. of Navy," realized his error and crossed out the word "Navy," and substituted "Treasury," requesting an interview for James Gordon Bennett, publisher of the New York Herald. In the end, Secretary Chase commissioned Bennett as a First Lieutenant to command his own yacht, which became the USRM cutter Henrietta and did blockade duty from Long Island to Port Royal, South Carolina, during the war. Although Bennett resigned from the USRM in May 1862, his tour of duty gave him a life-long interest in nautical and military affairs, for his newspaper became noted for its wide and detailed coverage of these fields. The well-equipped cabin of the converted 225-ton steam yacht Lady le Marchant, purchased by the USRM for $25,000 and then armed with four brass howitzers and renamed the Miami, accommodated many high ranking dignitaries at various times during the Civil War. On one such occasion, a rainy night in May 1862, President Lincoln, Secretary of War, Edwin M. Stanton, Secretary of the Treasury, Salmon P. Chase, and General Egbert L. Viele, U.S. Army, gathered in it, while cruising down the Potomac River to Fortress Monroe. This visit had been prompted by the public impatience over the stalemate at Hampton Roads, where General [George B.] McClellan had allowed the Union Army to become bogged down before the city of Norfolk. On this, his first visit to a battlefield, President Lincoln was trying his own hand at running a campaign. No sooner had the unescorted USRM cutter Miami delivered him safely at Fortress Monroe, then he set in motion the bombardment of the Confederate batteries at Sewell's Point by the Union fleet in preparation for an amphibious assault. The President himself, on May 9, boarded a tugboat and went here and there along the shore, scouting out a good place for troops to disembark and attach toward Norfolk. At 5:30 P.M., reported the log of the USRM Miami, "the President & Secretary Chase came off and gave us orders to immediately up anchor & follow the boat they were on to the rebel coast. On arriving lowered boat with officers and armed men to proceed on shore to reconnoiter." When several "horsemen who seemed to be soldiers of the enemy, appeared on the beach," Secretary Chase asked the President if the Miami's howitzers should "fire on them," but Lincoln "replied negatively." Returning [to] the Fortress Monroe, President Lincoln ordered an immediate infantry assault by boats, which was hastily organized. At 7 P.M., the Miami, as its log relates, "received orders to return to Lynhaven Bay & cover with our guns the landing of our troops on their arrival." Early the next morning, the log noted the sighting of "the transports fleet standing on for the land" and, at 4 A.M., the "transports landing the troops." Once ashore, the six regiments marched unopposed to Norfolk only to find it already evacuated by the Confederates. Only smoking ruins of the vast mounds of military supplies remained. This swift and easy victory for Northern arms apparently was due to President Lincoln's presence and personal drive right on to the scene. The following day, May 11th, the President rode through the captured town. At one point, he stopped to gaze upon the ruined hulk of the [Confederate] ironclad Virginia, blown up before the enemy's withdrawal. Interestingly enough, before being ordered by Secretary Chase "to proceed to the Washington Navy Yard as soon as possible," the commanding officer of the USRM Miami recorded in his log that he had received "on board the safety valve of the steamer ram Virginia as a present to be carried to Washington for President Lincoln." But, probably, the oddest looking and most valuable acquisition to the service was the USRM Naugatuck, also sometimes referred to as Ironside or E.S. Stevens in records. Of a radical design, she was a semi-submersible ironclad, needing only 15 minutes to take on enough water ballast to sink almost 3 feet. Thus, she could enter battle with only her impenetrable turret mounting a Parrot gun above water. Afterwards, she could pump the water overboard again in just 8 minutes flat. Being contemporary with the famous Monitor and Virginia, she was rushed south in hopes of tipping the balance in the Union's favor. In her first action, she served as bait for a well-laid trap. Her commanding officer, Lieutenant D. C. Constable, USRM, placed the Naugatuck within a quarter of a mile of the Confederate battery at Sewell's Point and bombarded it until, as planned, the Virginia steamed out to investigate. Lieutenant Constable then slowly retired toward a squadron of U.S. Navy steamers, amidst which lurked the Monitor, in hopes of trapping and destroying the Confederate ironclad. But the Virginia sensed danger, refused the bait, and retired. When Norfolk fell two days later, on 10 May 1862, the Virginia was destroyed to prevent her falling into Union hands, and the James River was opened to the Federal fleet. Hoping to beat the Army troops under General George B. McClellan into Richmond, the navy now took a chance by sending a naval assault flotilla up the James River to try to shell the Confederate capital into submission. The Navy commander placed the USRM Naugatuck in the van, with the Monitor and the other Union ships strung out behind her, "on account of her submerging qualities and little draft of water, as in case of obstructions or torpedoes, she could, by pumping out, evade them and give warning of the danger to the rest of the fleet." Just eight miles below the glittering prize, the squadron ran into a double barrier of "spiles, steamboats, and sail vessels" blocking the James River and guarded by a strong battery on Drewry's Bluff, supported by sharp-eyed marksmen in well-dug rifle pits. The four-hour long duel between naval and shore guns was a waste of gunpowder as far as the attackers were concerned, for victory was not possible without the support of Union soldiers ashore. When the USRM Naugatuck's Parrott gun exploded, "she continued in her position during the entire action, fighting her broadside guns." Although the first Union attack on Richmond had failed, Lieutenant Constable could modestly, but proudly, report: "My officers and crew behaved to my entire satisfaction." After being repaired, the USRM Naugatuck passed the remainder of the war guarding the approaches to New York City. "Keeping always under steam and ever ready, in the event of extraordinary need, to render valuable service, the cutters can be made to form a coast guard whose value it is impossible at the present time to estimate."